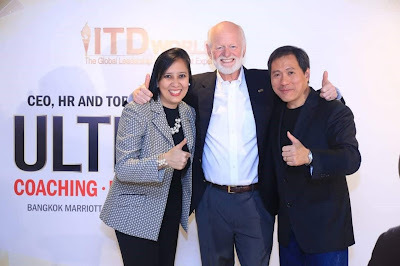 Dr. Marshall Goldsmith (center) joins executive coaches Serely Alcaraz and Dr. Peter Chee for a CEO, HR, and Senior Leaders conference in Manila on October 26, 2018. The road to business success is one that can be lonely and dreary. The unrelenting passion of entrepreneurs and startup CEOs, while initially beneficial for the organization, can soon become a deterrent to the growth of the business and even its people. And with their current knowledge and skillset, it is inevitable for any startup entrepreneur to seek help in developing and running the business. Dr. Marshall Goldsmith will headline a two-city CEO, HR, and Senior Leaders conference in Asia this October, with Manila as his last stop on October 26, 2018. He will be joined by top coaching gun Dr. Peter Chee, and master trainer and chief coach Serely Alcaraz. The leadership conference is organized by ITD, the global leadership development expert. For more information and registration, call ITD World Philippines at +632 887 7428 or email at itdmanila@itd world.com.